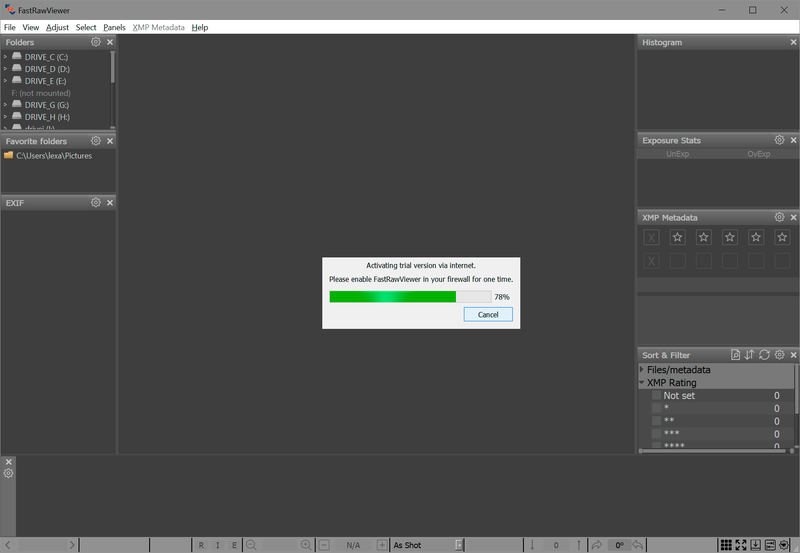 During the first run FastRawViewer will display a splash screen suggesting the activation of the trial version. No private data is transferred during the activation process; the only data that is passed through the Internet is FastRawViewer version number and unique non-reversible 64-bit hash code identifying your computer; this code can’t be decoded to extract any private or personal data. 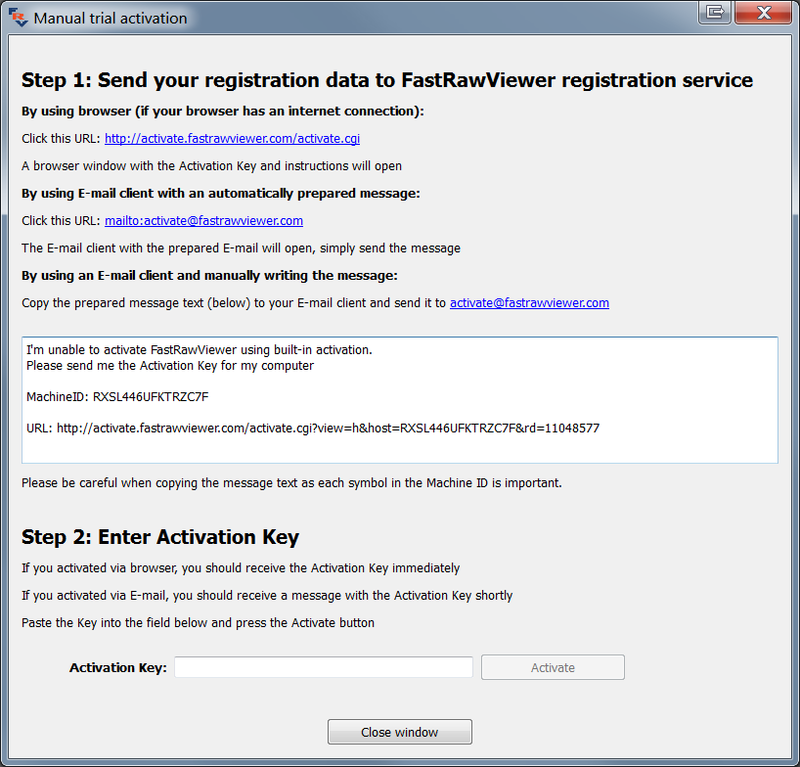 After the successful automatic activation the trial period begins; the trial time left is indicated in Help-About window and on the splash screen that pops up when FastRawViewer is started. Here you can allow FastRawViewer a one-time Internet access and press Activate Trial button to start 30-day free trial period. Pressing this Manual Activation button will take you to manual activation dialogue (for more details, please see below, in “Manual Activation” section). 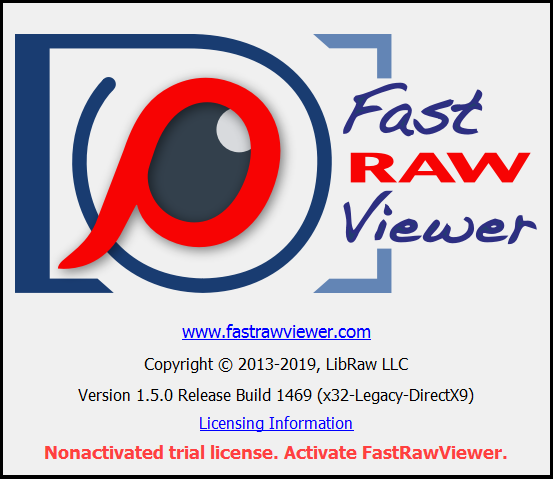 To use FastRawViewer after the trial period, the user will need to obtain a full license. After the license key is entered, please click Activate license button. The license will be activated and you will be able to continue using the program. To complete the activation (of both the trial and the fully licensed version) the program needs a one-time access to the Internet. If you cannot grant the appropriate Internet access permissions, you can activate the program manually. If the program fails to connect with the activation server (one-minute timeout happens), you will see a pop up alert, with a Manual Activation button on the bottom right of the notification window. By using browser (if your browser has an internet connection) – use this if your browser can connect to the Internet. By using E-mail client with an automatically prepared message – click the mailto:activate@fastrawviewer.com link and your mail client will create a new pre-populated email to activate@fastrawviewer.com You will only need to click send. By using an E-mail client and manually writing the message – you can send an email to activate@fastrawviewer.com using the text in the window below (“I'm unable to activate…”). If you choose to obtain the activation key via email, you will receive a reply email with the text identical to that which you would see in the web browser (the activation key, however, will be different). You can then use the Activation Key (from the browser or email) and enter it into the Activation Key field (it is best to use Copy-Paste, as every character of the key is important) and press Activate. After clicking the Close window button, the window will close and the FastRawViewer activation window will display the registration status. For each listed application, you can choose to use it (Use this app) or not (Skip). Additional applications (those that are not currently known to FastRawViewer, or some older versions of the known applications) can be enabled through Preferences – External Editors. Changing hotkeys (Shortcuts) is described below in Setting the Keyboard Shortcuts. DirectX 11 (Windows 7 and newer only). Windows XP/Windows Vista: DirectX 9 will be selected. Computers with old Intel graphics adapters on a separate chip (chipsets like G45, 845G, 965G, etc. ): DirectX 9 will be selected. Computers with two or more graphics adapters, or two or more monitors: OpenGL will be selected. All other cases: DirectX 9 will be selected. The above-listed rules are sorted through “from top to bottom” and the first fitting one is used. 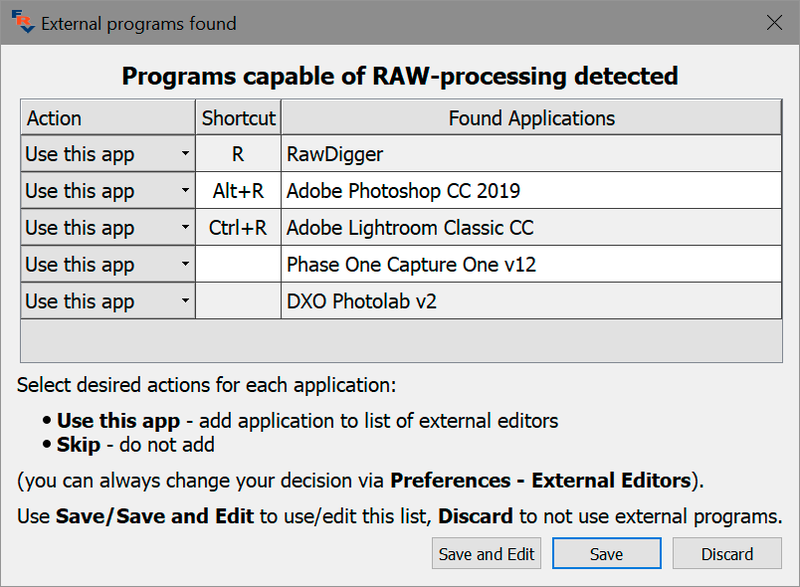 The choice of graphics engine is made once and stored in the Windows Registry, so that the process of the selection of the graphics engine is not repeated during subsequent launches of FastRawViewer. The automatic selection of graphics hardware acceleration can be, however, changed by the user, either through the FastRawViewer Preferences (see the “GPU Processing” section in the “Program settings” chapter), or by launching the Registry scripts (see the “Setting the graphics acceleration manually” section in the “Troubleshooting” chapter). If in DirectX11 mode: the program will switch to DirectX9 mode (so that DirectX9 mode will be active when the user re-launches FastRawViewer) and exits. If in DirectX9 mode: the program will switch to OpenGL mode (so that OpenGL mode will be active when the user re-launches FastRawViewer) and exits. If in OpenGL mode: the program will suggest switching to DirectX9 mode and re-launching the program. This is described in more detail in the “Troubleshooting” section.